Having been lovingly restored to its former glory, the interiors of Barton House offer the perfect blend of original period features and contemporary design. The Sherry family sourced antiques from markets across the UK all of which have a story behind them. This table is a Sherry family heirloom, originally owned by Martin Sherry’s mother. A few years ago, an antiques dealer was visiting Barton House to deliver some items bought from his shop. 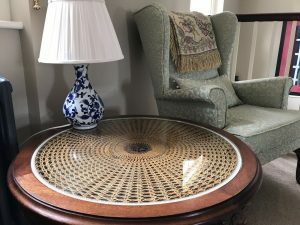 With a mutual interest in antiques, the Martin gave him a tour of the house and when the dealer spotted the table, he laughed as he had actually made it! Pleased to see an item he’d made all those years ago being taken good care of, he generously offered to restore and repair it, and it now sits pride of place on the upstairs landing. Steve Mitchell is a scenic artist with over thirty years’ experience in television and film. He has worked on over 100 films, making large scale backdrop paintings which he produces at great speed. 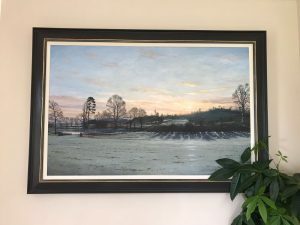 He painted this stunning oil painting, depicting the local Oxfordshire countryside, for the Sherry family home. 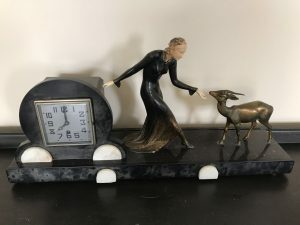 This art-deco clock was one of several items the Sherry family bought from Jones & Jacob Auction House in Watlington. Jones & Jacob, have been hosting regular fine art and antique auctions in Oxfordshire, and providing antiques valuations for specialist buyers and sellers around the London area since 1802. Over 200 years later, they continue to provide auction facilities, insurance valuations and probate valuations, for antiques traders, collectors, probate lawyers and individuals throughout the UK. Martin & Barbara Sherry are big fans of the Scottish artist Jack Vettriano. 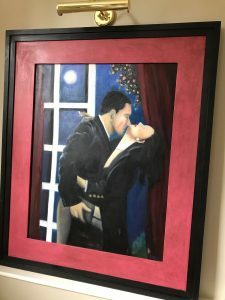 As a self-taught artist, he has made a name for himself with the way he manipulates paint in veiled glazes and meaningful shadows and in the hidden narrative, his enigmatic compositions provide. They have a close friend who having honed her talent for painting in the style of this great artist, they commissioned him to produce a number of pieces for Barton House. This bookcase, currently located in the Garden Room, is another family heirloom. 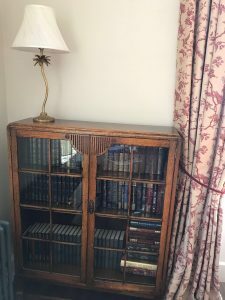 The varied book collection it displays includes classics from Jane Austen, John Steinbeck and Emily Bronte, and many of our guests enjoy switching off from modern life with a book and glass of wine in the Drawing Room.